If you told me that you were going to pare your closet down to one bag for work — a large shoulder-bag, satchel, or tote — I would tell you that it should probably be black. But most of us are not quite so spartan and have a two or three worky bags to rotate in and out of service. If this sounds about right to you, let me offer an unconventional suggestion: you may want to think about a yellow bag. Why yellow? you may be asking. First, let me clarify that I mean a bold yellow with orange undertones; this color is sometimes called gold, yellow-orange, sunflower, or marigold. That’s the shade I mean. If you are a Benjamin Moore enthusiast, I am describing Imperial Yellow. A mustard yellow works, too, though it’s not as clear a color as marigold. On to your [imagined] question . . . This shade of yellow looks great with all the neutrals: grey (all shades, including blue and purple greys), black, white, tan, and navy. Plus, it looks good with red, orange, purple, and many shades of blue. It looks equally good in all seasons. And it’s lively; people really respond to this color. Let me anticipate your follow-up question: Directrice, you are such a genius. How did you come to be so smart? 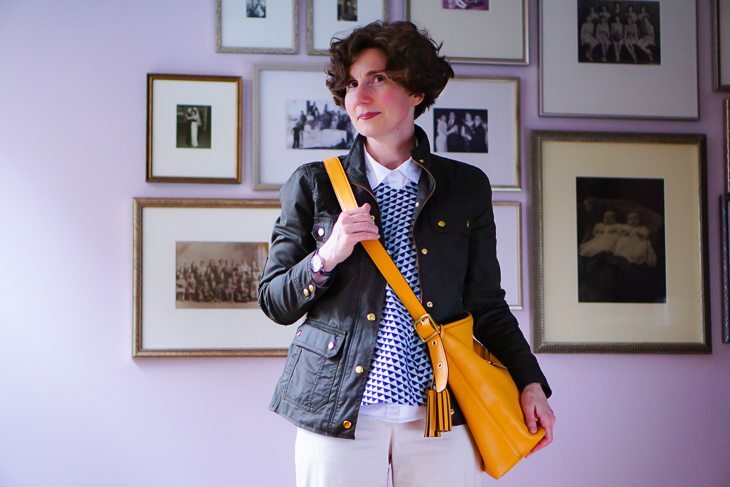 I was visiting Toronto a number of years ago for a conference and found myself at the M0851 store buying a messenger bag made out of the most beautiful marigold leather. Because the bag was very casual, I used it on the weekends, but whenever I carried it, I received many compliments. 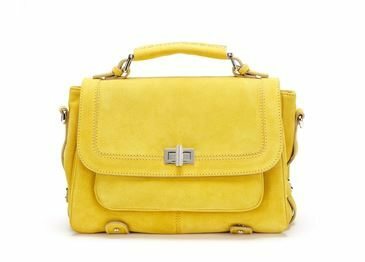 So I went looking for a more structured bag that I could use for work. 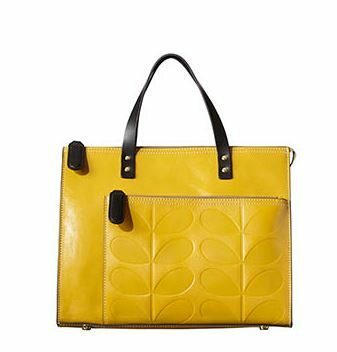 I found this bag — the Legacy Duffle in Sunflower — at Coach a few years ago. Like an unbounded artificial intelligence that has been programmed to pursue one goal (ARREST CLIMATE CHANGE) and may in the faithful pursuit of that goal wipe out humanity (HumANS ArE CAuSINg CLimAtE ChANgE), I have continued in this quest quite diligently and found more yellow bags. More yellow bags than I need. When I bought this Car Shoe bag from YOOX last winter, the fringe was actually longer than the bag. Little did I know that I was out in front of the trend I am seeing everywhere this fall. 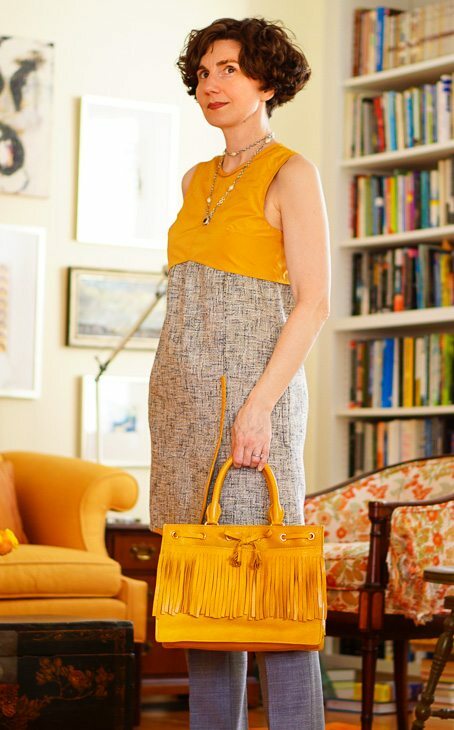 Regardless, the fringe seemed too long to me for a structured silhouette — indeed, the bag looked like a yak. So I took it to the local luggage and shoe repair shop and asked if they could give it a trim. The owner gave me a doleful look (he’s always giving me doleful looks) and declined the opportunity, saying he couldn’t do it any better than I could do myself with scissors at home. I doubted him, but took the bag home and did it myself. An imperfect job, but I still love the bag! And now the final descent into madness. 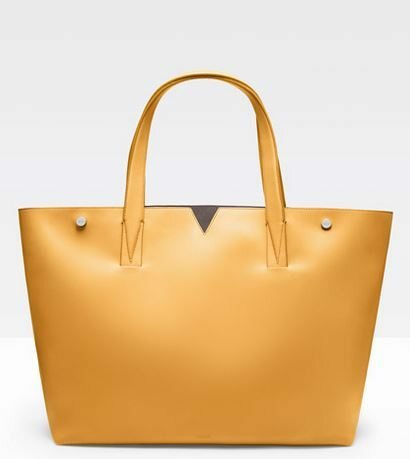 I acquired one more [final] yellow bag from YOOX because it was too beautiful to let slip away. This one is suede and as we have previously discussed, suede is a delicate material that must be handled with great sensitivity and tact or it will not last long. I don’t know how long we will have together. 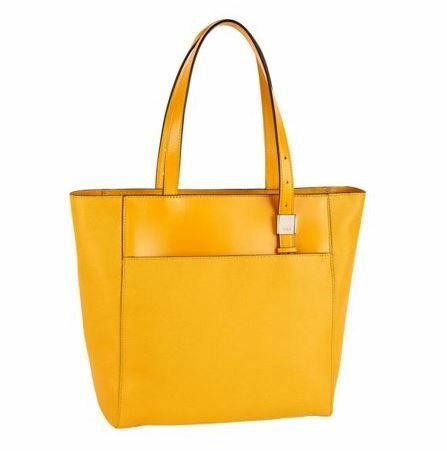 I also checked eBay and a few people are selling NWT Coach Legacy Duffles, like mine, in Sunflower. Have a terrific holiday weekend! Yes this is a very great bag colour Directrice! 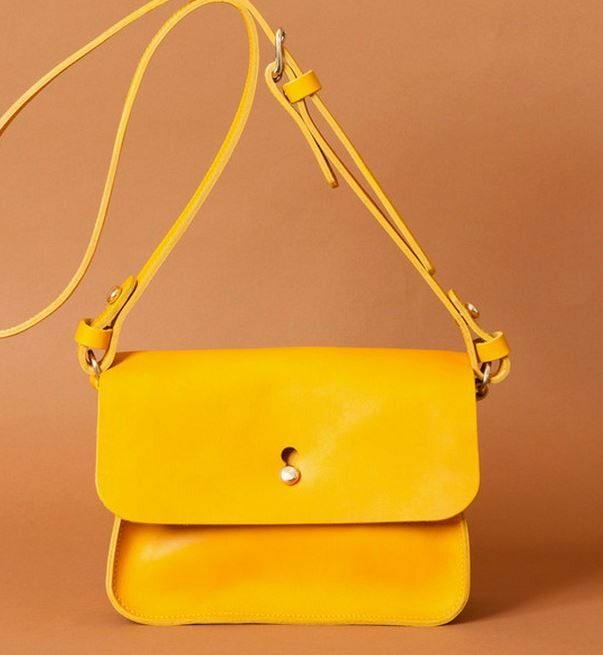 There is a British bag designer named Mimi Berry that has a small range of lovely bags made in England, and this season she has about 5 styles in just this colour (which I think she calls ‘mustard’). I have the Eric style, but if I ever purchase another, I’d like the Hebe. 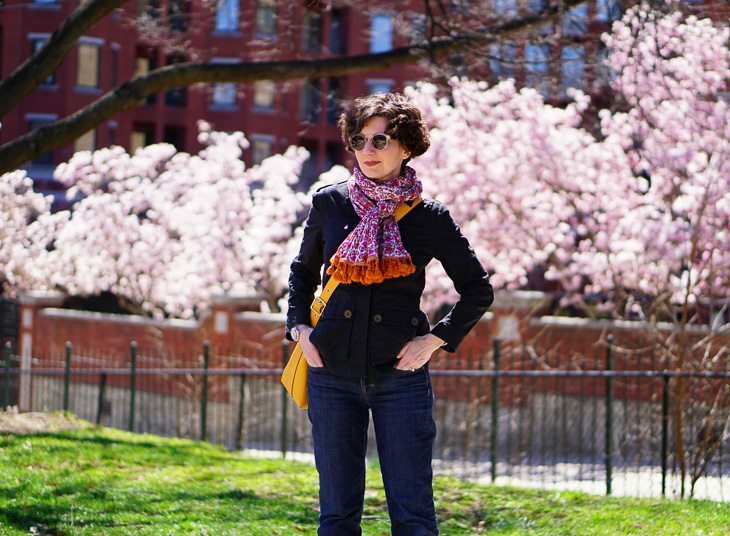 Hi Justine — I just checked out Mimi Berry and added the Robin bag (capacity!) to the post above. Thanks for the hot tip; her bags are beautifully proportioned and have such clean, understated elegance. What a brilliant suggestion! 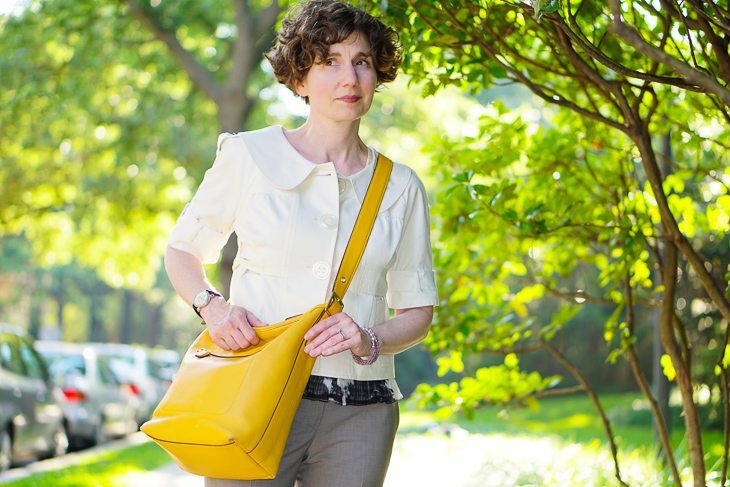 I had noticed your yellow bags, but I never thought about how versatile the color is. I could use another work bag, so I’m off to look for one now. To me, this is very daring. Thanks for the push! An added plus: it seems that the Tumi bag has a sleeve that slips over luggage handles. I’ve been looking for something like this for work trips.